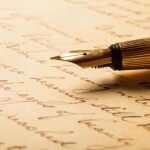 Yes, technology is impacting all aspects of business and especially marketing. But it is interesting that there are very few search, pitch or marketing management consultants who invest in technology to innovate their processes to increase their utility or robustness. Many are using relationship survey tools that have been around since last century or are calculating agency remuneration and compensation using a calculator and a spreadsheet. In the very first office TrinityP3 (or P3 as it was then) inhabited back in 2000 we were sharing with a technology development start-up called Smart Solution Group. Russell Hibbert, who had left ShowAds to set up his own tech solutions company, founded the company and we shared their offices in Southbank Boulevard in Southbank, Melbourne. It was a working environment full of ideas and projects and it was highly infectious. There were daily discussions on workflow processes and platform development and integration which led to us developing our very first online solution as an experiment, and to promote the idea of ‘whole brain thinking’ which is the concept behind the P3 part of our logo. Later we developed a system for automatically benchmarking Television Production Estimates, the failure of which was a valuable lesson in platform integration and integrated user experience. But those early days have led to many successful developments of marketing management tools that we and our clients use and benefit from today. Here are six of them. This is a phone app we developed with Lomah Studios. It was based on the calculators we had built for our website. But it was also because of our understanding that the world was very much mobile. Instead of having to go to a website, users could simply pick up their phone and access the calculator without even requiring internet access. Originally developed to the iOS platform, the success of the app led us to develop a version for Android and Windows Mobile. 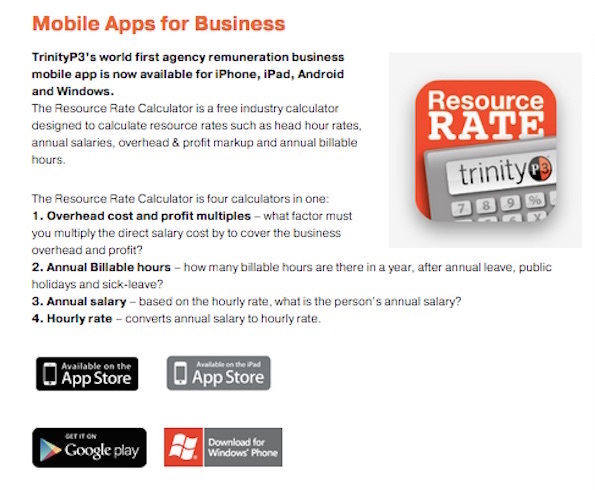 To find out more check out the details here, where you can download your own version of the Resource Rate Calculator app free. Ad Cost Checker is a database application developed by Pivotal Analytics and was driven by a belief that the huge amount of data we had on hand should be made readily available for everyone. The data comprised agency rates and fees across media, creative, account management, design, strategy and production, and for more than 20 markets and growing. Marketers, advertisers, procurement and agencies were often asking us for the benchmarks, so in this way we could make those benchmarks available for all to use. It provided us with a more structured and more robust system to manage the huge amount of data we have on hand and continue to collect each day. To find out more check out the details here, or register to use the Ad Cost Checker system here. Soon after we commenced business, we found ourselves being asked to assess and provide advice on agency fees and remuneration. 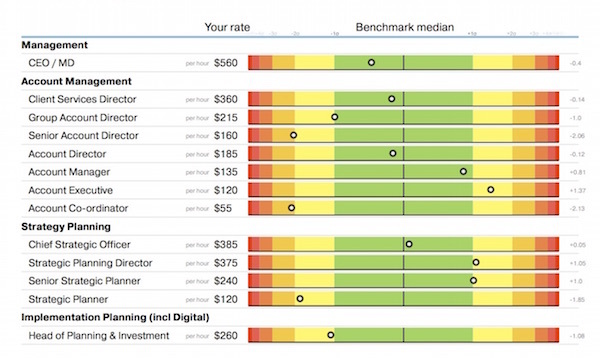 The best approach to do this is using a robust benchmarking methodology that not just looks at rates, but can actually calculate the cost of delivering the scope of work or schedule of work the agency is producing. In the past ten years this system has evolved and become increasingly complex as a reflection of the complexity of the advertising and marketing services agencies provide. The system today has hundreds of scope outputs and thousands of benchmarks within it to provide a structured, reproducible and robust calculation of agency fees that have been tested across markets around the world. To find out more check out the details on the evolution of the Scope Calculator here. After many years of recommending the same ‘360 survey systems’ that still exist today, we were frustrated by their inability to be able to measure, manage and maximise the roster of agencies. Instead of focussing on individual agency relationships, they ignored the important role of collaboration and co-creation in the advertising and marketing process. I was sharing this insight with Marek Lis in New York and explained to him the basis of a system I had been working on to achieve the ability to manage a roster of agencies. He introduced me to Young Minds Australia, a software development company in Australia and Nepal, and together we developed Evalu8ing. 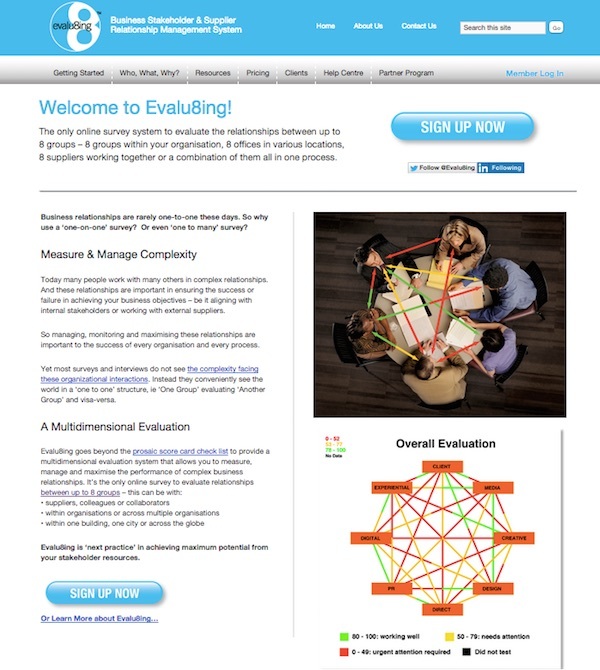 Since then Evalu8ing has been used for roster performance and collaboration management locally, regionally and globally. 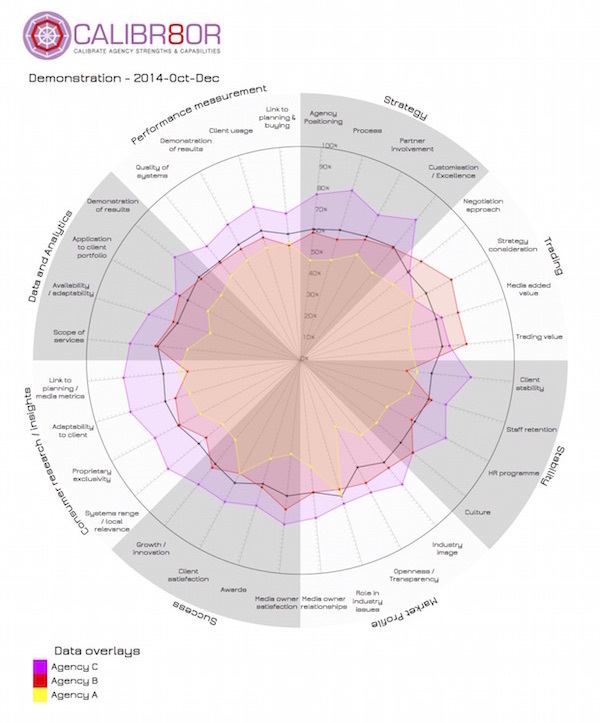 It has also been used within agency networks and client companies to create performance alignment. To find out more check out the benefits of the system here or go to Evalu8ing here. 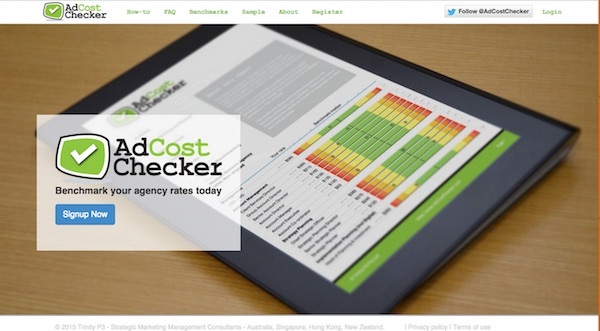 Having managed agency reviews and pitches for more than a decade, it became obvious very early on that we needed a robust and scalable way to keep track of the thousands of agencies across the multitude of disciplines and the breadth of markets. The Agency Register is a searchable online database, also developed by Young Minds Australia, that allows agencies to register the essential details we require to be able to recommend them to suitable advertisers. 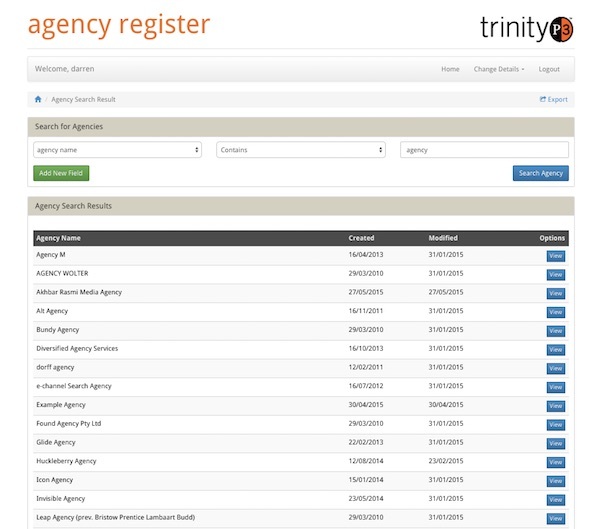 It also includes the ability to record and access performance and cultural observations made by the TrinityP3 consultants when visiting or working with those agencies. To check out the benefits of the system click here or agencies can go to The Agency Register here to register. 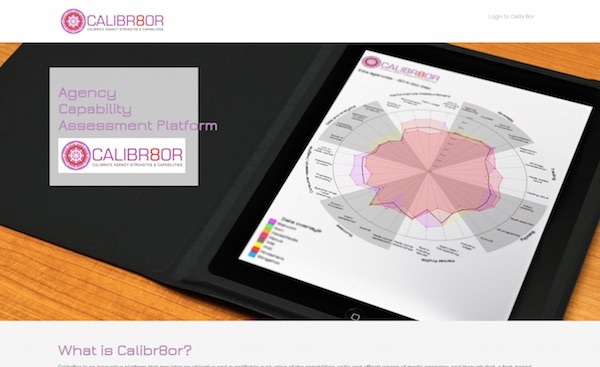 Calibr8or is actually a sister company to TrinityP3 and arose out of the mutual observations of Stephen Wright and I over the difficultly in truly assessing and calibrating the strengths and capabilities of the increasingly evolving media agency landscape. Working with Pivotal Analytics, Stephen developed the Calibr8or system, an innovative platform that provides an objective and quantifiable evaluation of the capabilities, skills and effectiveness of media agencies, and through that, a fact-based method to match media advertisers with media agencies based on the profile of their specific needs. It also provides media agencies and media owners with a quantified understanding of their strengths and capabilities compared to the market offering. To find out more, check out the benefits of the system here or go to Calibr8or here.